Paula Denk started her career with Viktor Barnowsky in Berlin. Until 1938 she worked for several theatres in Berlin, among them the Volksbühne. From 1938 to 1943 she was engaged at the Kammerspielen im Schauspielhaus. Adolf Hitler awarded her the title of Staatsschauspielerin (Actress of State) in 1942. From 1943 to 1944 she worked at the Berlins Künstlerbühnen. From the early 1930s she had also appeared in movies. From 1946 onwards she worked for many years under Gustaf Gründgens in Düsseldorf. Together with Gründgens she appeared in "Die Möwe" by Anton Tschechow. She also had parts in television productions. She was married to the actor Max Eckard. 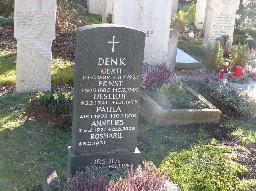 The grave of Paula Denk at the Nymphenburger Friedhof, Munich.